Nothing was going the way Shealy had planned. “Reasonable?” Donnell O’Leary demanded, his face turning an alarming shade of red. They’d just finished dinner and were leaving the restaurant as he spoke, his outburst drawing the eyes of the other patrons. Shealy had known her dad wouldn’t be happy about her plans, but she hadn’t anticipated this. She eyed his coloring with dismay. He’d already had one heart attack—she didn’t want to give him another. For a moment, his words robbed her of a response. She knew her mother’s body wasn’t in the grave—after the awful automobile accident her body had never been found. But six years had passed since her death and Shealy needed closure that still hadn’t come. It was so unlike her father, so insensitive of him not to understand that. She’d been in the hospital when they’d held the funeral services and then her dad had packed them up and moved them to Arizona. She’d never even seen the place where her mother rested, in spirit if not in body. But she didn’t want to explain to him why she was so determined to go there now. She couldn’t talk about the nightmares that chased her through the restless dark. Nightmares about her mother. Horrible, gruesome dreams that told the time had come to face everything she’d tried to forget. She needed to move on and that meant first going back. “It’s not safe there,” her father stubbornly continued as she stepped into the warm night air outside of the restaurant. The sharpness of his tone held a bite that stopped her on the shadowed blacktop. Somewhere in the back of her mind a strange tickling sensation began, creeping down her spine, making her skin pucker despite the summer heat that still held tight to the evening. Ah. Inside, she gave a sigh of relief and a mental eye roll as understanding hit her. For a minute there, he’d actually rattled her. Donnell O’Leary was a conspiracy theorist to his wee Irish soul. He had issues and opinions about everything from underworld religion to common traffic laws. No doubt next he planned to spout about the Troubles or the Government or, God forbid, the Protestants. A gust of hot wind blew across the parking lot, chasing the echo of his anger. The restaurant had been packed when they’d arrived and they’d had to park in the back, by a dumpster. Now the lot was dark and deserted. The burned-out streetlight over their car left shadows rasping against the heated tar and whispering sounds scampering across the abruptly taut silence that followed. She wanted to tell him to calm down. She was twenty-four years old and she didn’t need his permission, but an undefined feeling of threat prickled and poked at her. She opened her mouth to demand to know what these mysterious things he’d been protecting her from were, but an instinct as old as time silenced her and urged her toward the car. Pushing her to get out of the open. “Shhhh,” he said. His eyes were wide, his expression frightened as he scanned the empty parking lot. The air grated against them, lifting the hem of her skirt and blustering beneath it. It was hot—always hot in Arizona, but now that heat had weight and a dark, malevolent substance. A trill of fear crept down her spine, but she didn’t know what had scared her, why she suddenly had a sense of déjà vu that clenched her tight and terrified her. “Get to the car,” Donnell said, turning her and pulling her to the Toyota next to the dumpster. A sound—like a hundred nails running down a chalkboard, like a thousand knives scraping china, like millions of screams that went on unending—ripped through the oppressive quiet. The blistering cacophony surrounded them, an invisible wall that herded them into shadow and gloom. “Dad, what is that?” she asked, gripping his hand, feeling the tremors coursing through his body. That tangible evidence of his alarm escalated her own. Her dad had weakened with illness, but remained one of the bravest men she’d ever known. He tried to pull her toward the car, but the air felt strangely gelatinous, a membrane holding them captive in the small space they filled. Beyond the unseen barrier, the everyday world faded until there was only dusky night alive with that terrible sound. Shealy clapped her hands over her ears and so did Donnell, both of them turning in place, searching for an exit. Seeking an explanation. Beneath her feet the asphalt began to rumble and shake. Pieces of the parking lot cracked, spidering like a shattered windshield. Was it an earthquake? A car alarm joined the melee, as if in response to her panicked thoughts. She grasped at a perverse sense of comfort the explanation brought. Earthquakes were real. Shadows that hemmed people in weren’t. But even as she thought it the darkness to her left split down the middle, like a huge piece of velvet ripped in two. She heard the sound of it tearing, felt her breath seize in her chest as she watched the fissure grow. Felt again that unfathomable sense of déjà vu. Through the rent in the night, she saw a rock and shale wall shooting straight up and perpendicular to the earth. At its base there was a huge stone plateau and on it stood a man and teenage boy. Mouth dry, Shealy saw the man suddenly look up, his golden brown eyes wide with shock. For an instant they stared at one another, Shealy and this man, and she felt the touch of that glance like she did the heat, the fear. A queer sense of recognition staggered her. Who was he? Where was he? Donnell muttered something that sounded like Tier Nawn and squeezed her hand tightly. She jerked her gaze from the man to her dad, saw the anger and . . . recognition in his face. She’d barely had time to process that not only did Donnell see the man, but he recognized him too, when a second section of darkness shredded to her right and through the gaping hole she saw another man, standing alone in a white room that gleamed with marble. Like a photonegative of the dark and powerful warrior to her left, this one had pale skin with blue eyes that blazed with rage and...triumph. “Feck,” her father shouted and tried to put Shealy behind him, but the world shuddered violently and nearly knocking them off their feet. As if looking through windows, the two men caught sight of one another and the reaction was instantaneous. Murderous. The one with the golden-brown eyes lunged forward, exploding from the gash in the darkness like a demon. The pale man moved only seconds slower. In a heartbeat they stood in the swirling circle of confusion with Shealy and her dad trapped in the middle between them. The blond man made a grab for Shealy, but her father blocked it. Enraged, he struck Donnell hard in the face, making him stagger back. Shealy’s screams joined the chaos as she tried to get around her father and stop his attacker. Her dad was not as strong as he used to be—illness had withered away much of the brawn that he’d once worn so easily. But he seemed determined to keep her safe. The pale man came at them again, but the dark one with the luminous golden eyes—the one her dad had called Tier Nawn—shoved the other man back, shouting something at him that Shealy couldn’t understand. It felt like the world exploded, imploded, ripping free of its moorings. Everything began to spin. The ruptures in the darkness shrank, that gummy membrane surrounding them grew tighter, pinning them. And yet, the pale man strode forward easily, intent on Shealy. She didn’t know why, didn’t know how to evade him when the very air had become an enemy imprisoning her. What, in God’s name, did he want? Her father tried to stop him but he gave Donnell a hard blow that sent him sprawling at her feet. She was still screaming, but she couldn’t even hear her own voice over the roaring coming from beneath her feet, overhead, all around. His fingers reached for her throat and in his eyes she saw victory. And then the other man slammed into them both, knocking the pale man away and falling on top of Shealy. All the breath left her body as he crushed her beneath him. Her head hit hard against the asphalt. She saw stars, bright bursts of color, then black on black nothingness. “Who?” she tried to ask. Who are you? But the viscous cocoon caved in around them and Shealy felt a great suction pulling her. She cried out for her father, heard the echo of his voice as he shouted her name. She turned her head, saw him prone beside her, managed to get her hand out and touch her fingers to his just as the pale man, relentless and determined, crawled over Donnell’s inert body to reach her. But in the same instant, a force she couldn’t comprehend hauled her toward that great tear in the darkness, to that rocky cliff she’d glimpsed earlier. The suctioning pressure grew until it felt like it would crush her, collapse the cage of her ribs, and compress her skull leaving her nothing more than flattened goo on the sizzling parking lot. The man on top of her tried to ease his weight, pushing up with massive arms. He was enormous, his muscles so sculpted they looked illusory. But the weight of him added to that grinding pressure left her in no doubt that every single inch of him was real. He had dirt smudged on his face, a bloody cut on his collarbone, and eyes that burned like whiskey. He stared into her face as if he might find answers there. If she hadn’t been so scared, she might have saved him the trouble. Shealy O’Leary didn’t have any answers. Still he probed, grimacing as the air compressed, excruciating and unyielding. She stared into his eyes, feeling his ragged breath fan her face, the tremble of his arms as he fought an unwinnable battle with the agonizing pressure. The force bore down on them both and she clenched her eyes tight, knowing she’d probably never find out the answer because whatever was happening to her would likely going to kill them both. The man fought the weight of it but his arms finally gave and he collapsed. His body covered her from head to toe, their faces side by side, his breath now a hot burst against her ear. 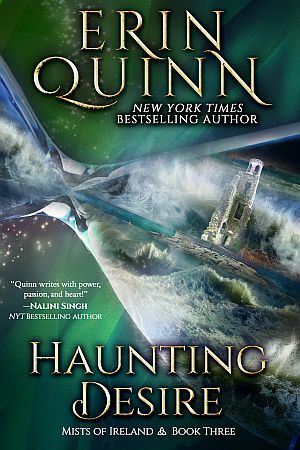 The shrieking sounds rose to a crescendo and then suddenly it felt as if they’d punched through the crust of asphalt and were falling. . . .
Sign up for Erin Quinn's newsletter or enter Erin's monthly contest to be automatically added and eligible for free books. Erin Quinn loves to talk to readers. If you have a book club or reading group and would like to read HAUNTING DESIRE, I will work with you to deliver autographed copies and, whenever possible, come to speak at your group. Please contact me for more information.